Cooper is coming up on his 1 year anniversary. He started January 19th of 2015. He is such a nice guy to work with and does a great job. 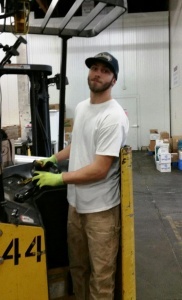 Cooper started out as an order puller and has moved on to the receiving department as a forklift operator. Go Cooper!! !